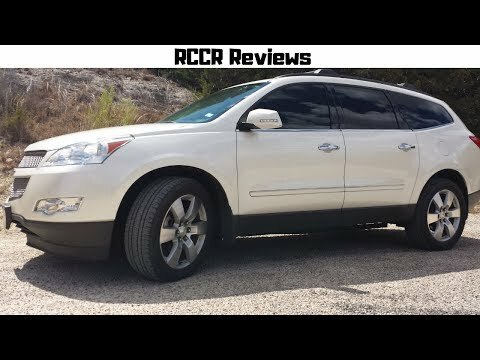 If you're looking for a big family vehicle with excellent safety ratings, the ability to tow 5,400 pounds and reasonably good fuel economy for its size, the 2011 Chevrolet Traverse may be the best game in town. My traverse, good and bad. My Chevy traverse is fun to drive. It is a SUV but drives like a car. It has a v6 engine and feels like enough power when accelerating to pass a car on the highway. I have even used it to pull a two horse trailer short distances. The traverse seats 8. The third row seat is a little short on leg room, but fine for kids. The seat configuration is easy to change, laying down the middle or third row to make room to haul things. The controls for the driver, such as lights, radio and ac/heat are user friendly. The sound system is adequate. The 2011 traverse offers OnStar service while is nice for hands free calling. I have had many mechanical problems with the 2011 traverse. The AWD system malfunctioned frequently, the timing chain had to be replaced, the power steering pump leaks. The dealer in my area was not adequate in finding a resolution to the steering pump issues. I did purchase an extended warranty which covered the AWD issue, but not the timing chain. When a headlight bulb burns out on the traverse, it needs to be replaced through the wheel well which makes it expensive. Although there are many thing I love about the traverse, I will look for something more mechanically reliable for my next vehicle. Traverse is reliable, but needs upgraded features to be comfortable for all. I haven't had any huge problems with my traverse. It is very reliable. In the winter time the all wheel drive is awesome and allows me to get out of my snowy driveway as well as travel relatively safely on bad roads. I have a very basic model so I miss some of the bells and whistles (DVD players, etc. ) For the kids. I have a bench seat in the middle which is nice because it allows for more seating, but I miss the convenience of captain chairs to allow people to just walk through to the third row. Although my 7 year old daughter and niece can pretty easily move the bench with the release features to get into the back. With a bench seat in the middle there is significantly less leg room for adults who may sit in the third row. This summer I did have to repair my ac unit, which was expensive, but other than that I have only had to do routine maintenance. Amazing family car and every day driver. I purchased my vehicle because we outgrew my previous vehicle. It is easy to drive and has held up very well in the 5 years I have owed it. With regular maintenance, we have not had a serious issue arise yet. The captain chairs in the middle really make it nice when my kids are getting in and out and helps prevent issues of feeling over crowded. The seats are very comfortable and allow you to adjust lumbar, etc. for maximum comfort. It handles well in all weather driving.